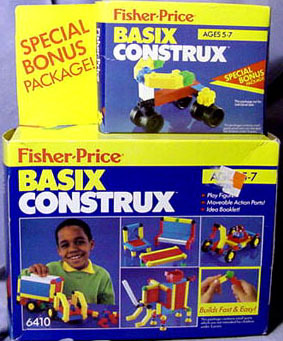 Description: This set includes a variety of Basix Construx pieces that can be used to build several different things. These brightly colored pieces are the same size as older Construx sets and are interchangable with them. Designed for children ages 5 to 7 years old. FPT16272 - 2 each - White 4-1/4" long straight connector beam (measures 4-1/4" long, 1/2" wide, 1/2" deep). FP6410SET1989 - Complete set in original box. WFL: 07-AG-17-4-C.